H300 and H800 are remotely operated vehicles intended for inspection, observation and light works. 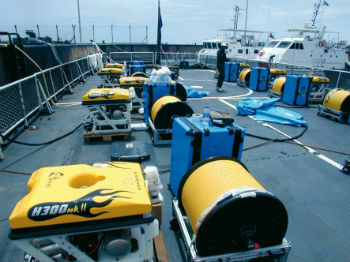 Power and thrust of H300 are sufficient to withstand sea currents up to at least 3k. H300 and H800 are equipped with a high performance viewing system, both with a color/zoom TV camera (mounted on a full Pan/Tilt unit) and a B/W very low light TV camera. A single and ergonomic hand controller allow to both control the ROV and a 5 functions manipulator arm. The control unit incorporates the power supply unit, and offers a PC screen with either video only, or the combination of video, sonar display and digital still control. Due to compact size and responsible weight, H300 and H800 are easy to handle and install on board of ships.